Most of us like dal. Even kids love to eat dal rice. 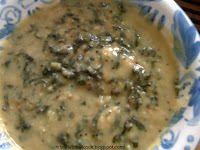 When it is done with Palak (Spinach), it is more healthier and delicious. Rekha prepared this dish for us and it came out the same way as my mother's recipe. Cook the dal with turmeric powder, Garlic, Ginger in a pressure cooker for 4 hisses. Let it cool and then mash it. In a pan add some oil, mustard seeds. When the seeds pops, add hing,cumin seeds. Add Urad dal and when it turns light brown, add onions, red chillies and fry for 1 min. Now add the tomatoes and fry. Add the cut spinach and some water and cook. When the spinach is cooked add the dal from the cooker. When it comes to a boil add salt and stir. Let it cook in a Sim flame for 2 min and then serve hot with rice,chapatti.